How does a financial plan help you? A strategic plan is essential to understanding your goals and can help you take control of your financial future. Having a clear and proven process is imperative to achieving success. This six-phase process of developing a comprehensive financial plan begins with a confidential conversation where we work to clearly define and understand your goals, priorities and financial circumstances. A core element of financial planning is an analytical assessment that quantifies your ability to achieve multiple financial goals. 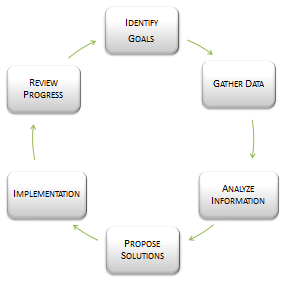 In order to complete this assessment, we gather the necessary data and then move to validate existing approaches and assumptions, discover possible shortfalls, and identify appropriate action steps and solutions. Proper implementation is required to put your financial plan in place. At this stage in the planning process, we develop strategies to determine how your resources can be effectively applied to address your needs. Investment models and portfolio analytics are incorporated into recommended strategies that are designed to help optimize returns while aiding in minimizing risk. Financial plans are based on a set of assumptions that reflect current financial conditions, priorities and expectations for the future. It’s important to track and review progress often.